United Nations Secretary-General Kofi Annan has said that he sees no basis at present for the use of force against Iraq. Mr Annan told Israeli radio that Baghdad was co-operating with UN weapons inspectors and that no military action should be considered at least until they had reported back to the Security Council. United States President George W Bush later said no decision had yet been taken to go to war with Iraq. "I hope this Iraq situation will be resolved peacefully," he told journalists at his ranch at Crawford, Texas. He added that the US was not sure whether Iraq had nuclear arms despite attempts to develop a programme in the past. Earlier, an unnamed weapons inspector told a US newspaper that he and his colleagues had found no concealed material in Iraq. The inspector added that he had seen none of the intelligence reports that Washington has said it is supplying to help in the search for weapons of mass destruction. Meanwhile, Iraq has invited chief weapons inspector Hans Blix for talks. The official news agency INA said a letter had been sent to Mr Blix asking him to come to Baghdad between the second and third week of January. Mr Annan said he expected the weapons inspectors to produce their first report on 27 January, although there might be an interim report before that. But one of the inspectors, who spoke to the Los Angeles Times daily on condition of anonymity, said that they currently had "zilch" to put in such a report. "We haven't found an iota of concealed material yet," he said. BBC Middle East analyst Roger Hardy says a picture emerges from the inspector's remarks of a team of experts under intense pressure from Washington to produce results but up against an Iraqi Government that is always one step ahead of them. The inspector said Iraqi officials had faster cars and better radios with which to warn colleagues where they were going and what they were looking for. They were forced to behave like spies, he said, passing information to each other on paper to avoid bugs and often driving in circles in an attempt to confuse their minders. But the inspector said even unlimited access was not enough. "Even if they open all the doors in Iraq for us and keep them open 24 hours a day, we won't be able to find a black cat in a dark room, especially if it is not there," he said. "We need help. We need information. We need intelligence reports if they exist." 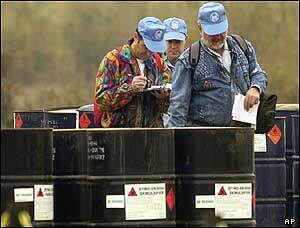 However, a senior US official told the LA Times that "high-quality" information on chemical and biological weapons was being passed on to the inspectors. The inspector said that if this was so, he had not seen any yet. He was sceptical about whether interviewing Iraqi scientists would produce any results. "It's stupid to think that we can offer them to go abroad to testify," he said. "Once any of them expresses a desire to go abroad for an interview, his brains will be kicked out in no time - his and his entire family's." The inspector said he and his colleagues thought it possible Iraq really had eliminated its banned materials. But it still had its scientists, who could resume their deadly work, he added. "The Iraqis are bending over backwards to be helpful"